Last year, the first phase of the project, implemented in the Adi-Harush camp, involved the improvement and extension of the electricity grid and connection of community services – including markets, school, communal kitchens, and a wellness centre for women and girls. In addition, 4 km of public lighting with LED technology luminaires were installed. Over the next three years, the five partners of Alianza Shire will work together with the refugee population and host communities in Northern Ethiopia to further improve their access to electricity. Last 19th July in the city of Shire, Tigray, Alianza Shire members and ZOA presented the project that will be developed over the next three years to improve access to electricity in four refugee camps in this region, as well as for their host populations. 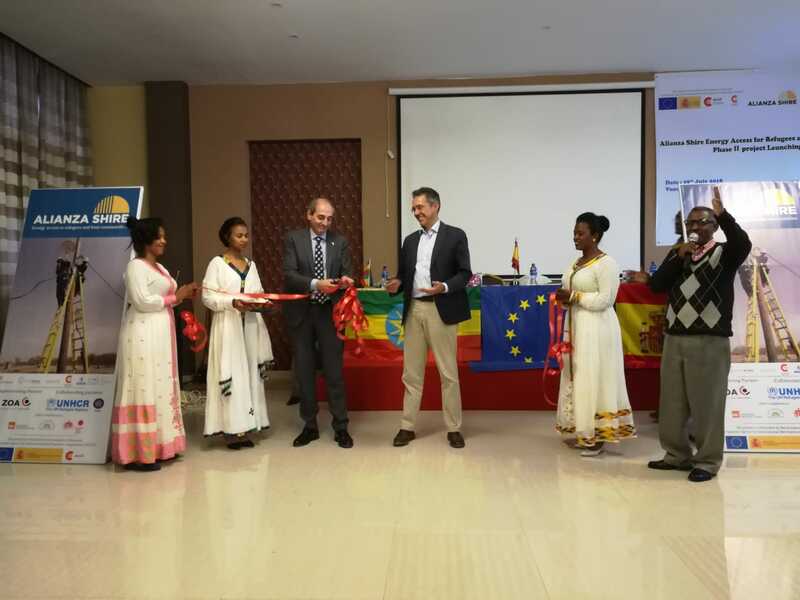 The Spanish Ambassador to Ethiopia, Borja Montesino Martínez del Cerro, and Johan Borgstam, the European Union Ambassador in Ethiopia – co-funder of this new project through the Trust Fund for the Horn of Africa – also attended the presentation. 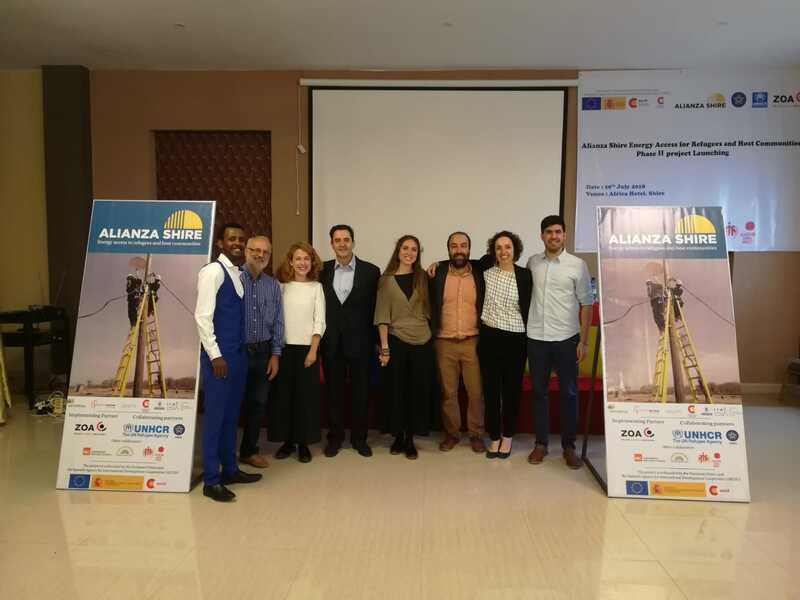 Alianza Shire, a Public Private Partnership, was formed in 2014 by three leading Spanish companies in the energy and lighting sectors -Iberdrola, Signify (previously Philips Lighting) and ACCIONA Microenergia Foundation-, Spanish Agency for International Development Cooperation (AECID) and the Innovation and Technology for Development Centre (itdUPM) from the main technical university in Spain -Universidad Politécnica de Madrid. The aim of the project will be to improve the living conditions and create livelihood opportunities of the refugee population living in the Shimelba, Hitsats, Mai-Aini and Adi-Harush camps, as well as their surrounding communities, by extending access to the electricity grid, installing solar home systems (SHS) and street lighting, reaching around 40,000 people. All this will be achieved by focusing on two aspects: the capacity building and the design of joint businesses, both geared towards the refugees and the host communities. In 2017, Alianza Shire completed its first project in Adi-Harush camp, where more than 8,000 Eritreans live, providing electricity to a school, community kitchens, and small businesses , as well as the installation of four kilometres of public street lighting. The impacts of this project have been numerous, including the reduction of deforestation in the area – mainly firewood collection -, reduction of greenhouse gases emissions from firewood and diesel combustion (as well as economic savings) and greater security for girls and women, especially in the night. Representatives of entities that will collaborate on the project, such as the Ethiopian Electric Utility (EEU), the United Nations High Commissioner for Refugees (UNHCR) and the Administration for Refugee and Returnee Affairs (ARRA), were also present at this morning’s presentation in the city of Shire.